The thing is, it also happens on minibosses, so the health bar suddenly disappearing then reappearing would be weird. Still a valid and good alternative. Also, shouldn't it match Zero's palette anyway? Or would that interfere with the Zero's weapon color patch? This essentially means that instead of having to gather every single possible upgrade (IE: Sub-Tanks, Heart Tanks), you can just get the armor pieces and collect each chip at the pink capsules. You can change what chip is active by going back to the capsules, but essentially they get stored into your inventory instead of straight up disappearing. Or you can go the normal route and gather all upgrades and still get it that way too. Figured it'd be a fun alternative route to getting it. It's not a major game changer or anything but it is kind of fun. This is a palette bug really. The only real way to fix this would be to shift the explosion palette to another location then rewrite the palette being used back. I could alter the blue explosions but it'd look extremely gross. It's just a minor graphical but and I've been lazy to fix it since I'd have to do special cases until I was able to figure out a specific way to make it work across the board. It's alright. It's not an important bug, it's just something I noticed. I'm pretty sure it won't bother that many people, so if you feel like it's more of a hassle than it's worth that's totally fine. 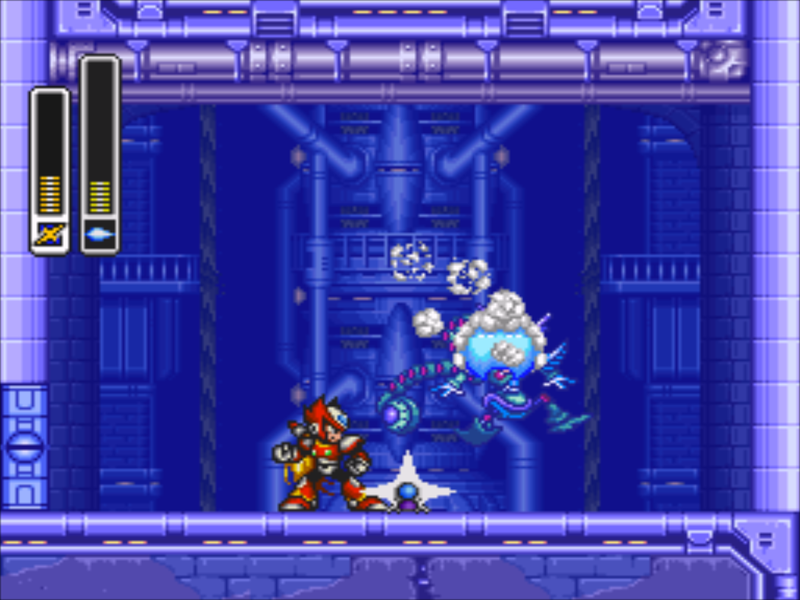 That screenshot reminded me: I don't know if this has been brought up before, maybe even by me, heck if I'd remember, but ever since I noticed it, it bugged me how X3's weapon energy bars use different shades of white/gray/black than what is used by Hyper C and the health bars. I think X2 has this "issue" too, less so, but anyway. Instead of asking, I figured it out myself and changed them to match the health. This does change some weapon icons slightly, but nothing detrimental at all, 100% worth it if you obsess over stupid things like I do. This should be applied over a headerless Zero Project 4.0. I might change up the weapon icon colors too, like Acid Burst, which I think looks really washed out either way and looks much better in the menu. I was reading the readme for this and remembered you had mentioned extra character slots, how hard would it be to make one of those an X that never gets armor? I think X5 and up have this option already.